It's okay to "ooh" and "ahh"
The fifth addition to Tama's wondrous Warlord Collection, the Athenian, is perhaps not meant for your garage basher. And if you're a touring band with a roadie named Bif, you might want to keep this baby out of his paws. But if you're a connoisseur of high-end drum kits and have a budget for elegance, how can you resist? Refined, warm, and so beautiful it deserves to be in a glass case, the Athenian snare is a true work of art. Comments Terry Bissette of Tama: "Our new brass Warlord Athenian, like its steel Spartan counterpart, features R.S.E. Resonant Sound Edges for more projection and increased fatness. However, the Athenian sound is more controlled and warmer than the Spartan, which makes the Warlord Athenian the right choice for players who favor the tremendous traditional tones of the great old vintage brass snares." The KBR146C Athenian features a 1mm brass shell with a special plated finish and includes a deluxe hardshell carrying case. The list price is $1,199.99 U.S. The brass Athenian joins the original four members of the Warlord Collection, the Spartan (stainless steel), the Masai (bubinga), the Valkyrie (maple), and the premium-pricedPraetorian (bell brass). 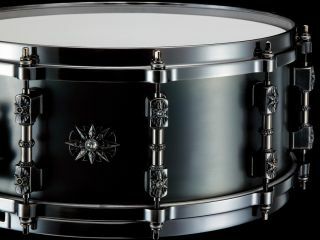 All Warlord Collection snare drums feature die-cast hoops, and lugs featuring cut crystals by Swarovski of Austria.